NYC – With Tohpati’s 3rd release (2nd as a trio) on MoonJune, recorded in Los Angeles in September 2013, we see the Beckian progressive metal riffing of 2012’s Tohpati Bertiga ‘Riot’ supplanted by a pairing of compositional dexterity along with the unique guitar voice that is the essence of Tohpati, one of Indonesia’s most famous guitar players. Though there is no shortage of acrobatic axe-wielding on ‘Tribal Dance’, Tohpati’s democratic interplay with the formidable world class rhythm section of Jimmy Haslip and Chad Wackerman is the real star here – creating a powerful synergy that gives voice to the whole of the music over its parts and delivering a richly rewarding listening experience. Power chords, distorted spare note leads, chugging rhythmic grooves and nuanced jazz phrasings are all summoned up by Tohpati, as he locks in with Haslip’s dubmaster basslines and the rubber-limbed kitwork of Wackerman, creating tracks of infectious syncopation and of sufficient complexity to warrant a player recount. 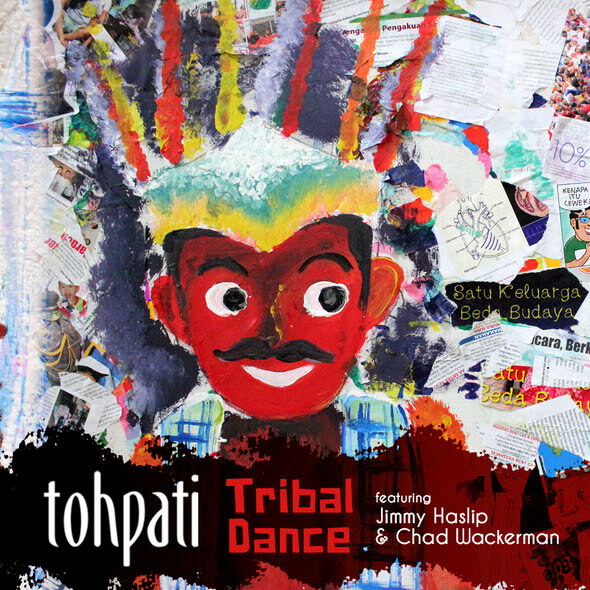 Aside from a few ambient vocal samples, ‘Tribal Dance’ is an instrumental album, though many of Tohpati’s melodic guitar lead lines feel “sung” in both song context and in the expressive way in which they are played. This diversity of guitar voicings and textures, along with the enthusiasm and chemistry between the players, will keep this disc in heavy rotation. Fans of Jeff Beck, Wayne Krantz, Allan Holdsworth, Scott Henderson, Oz Noy, and, of course, the Indonesian guitar icon Dewa Budjana, will surely want to pick this up.